Who goes to rehab? Ask the person on the street and you’re likely to be told, on the one hand, celebrities, who spend a month or two at luxury residential rehabs, and, on the other hand, former heroin addicts, who line up every morning at methadone clinics. These popularized notions present an interesting (the very rich and the very poor) but grossly inaccurate picture. 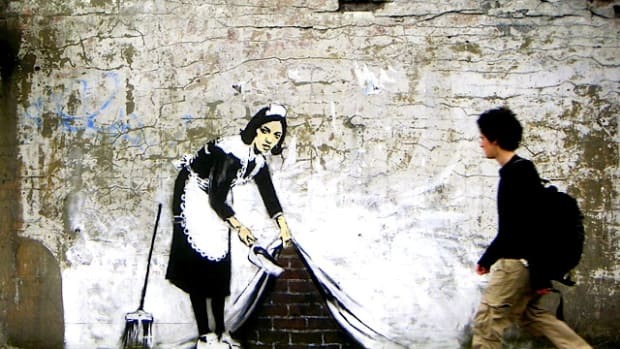 The reality, of course, is that problematic substance use cuts across all demographic lines. And so does addiction treatment. Sort of. We know that factors such as socioeconomic status and race influence whether a person gets treatment or gets sent to prison, for example; these factors also influence the type of treatment available. But it may come as a surprise that the drug of choice plays a significant role in determining who receives treatment. 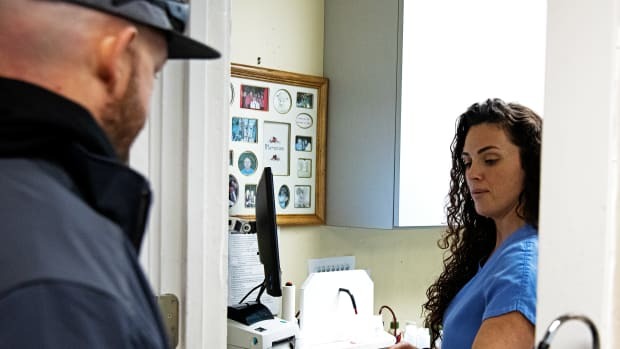 If we look at the data from the large epidemiological studies that have been done nationwide, we can learn more about that—and also about who recovers from problematic substance use on their own, without rehab. This kind of recovery, which falls into the category of natural recovery (also known as spontaneous remission), is common—so common, in fact, that it calls into question the general view that everyone with problematic substance use needs rehab. Data from the Substance Abuse and Mental Health Services Administration (SAMHSA)’s National Survey on Drug Use and Health (NSDUH) shows that there are large variations in who goes to rehab (private, public, and related facilities) based on their drug of choice. This is true both for those with a Substance Use Disorder (SUD) and for all non-medical substance users, including recreational users. 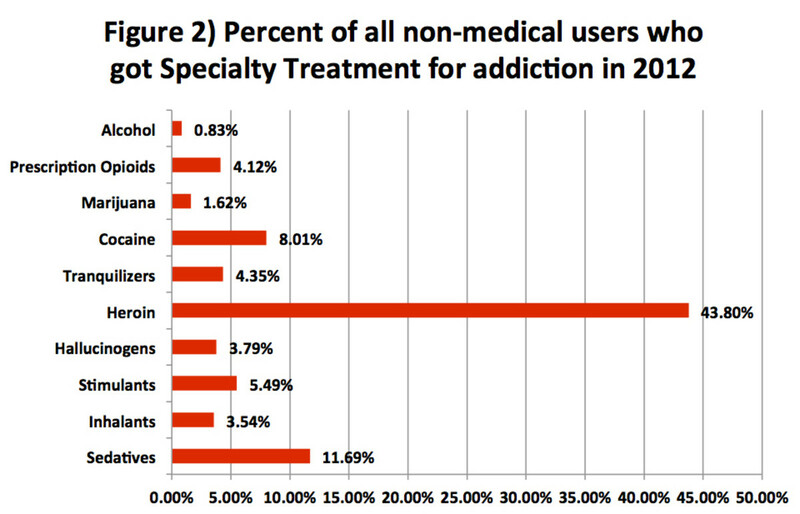 Figure 1 shows the percentages of people with SUDs who utilized “specialty treatment” for addiction in 2012. 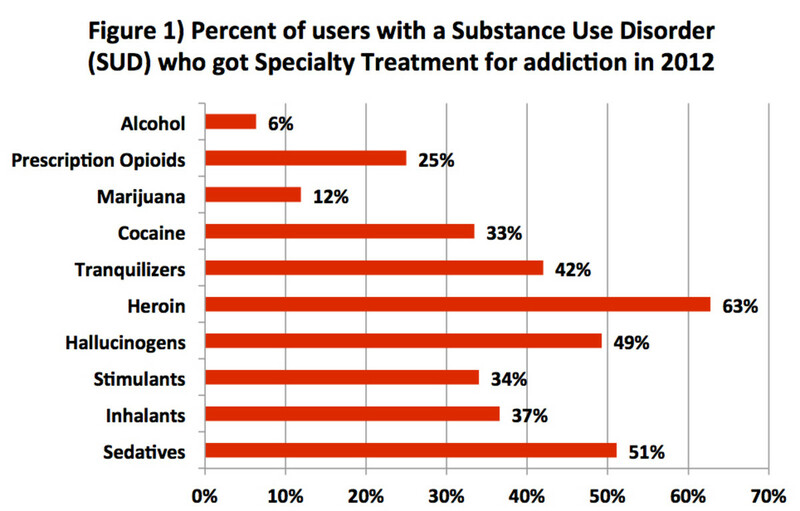 Figure 2 gives the percentages of all non-medical users of a substance who utilized such facilities that year. “Specialty treatment” for an SUD is defined by SAMHSA as treatment received at any of the following: hospitals (inpatient only), drug or alcohol rehabilitation facilities (inpatient or outpatient), or mental health centers. 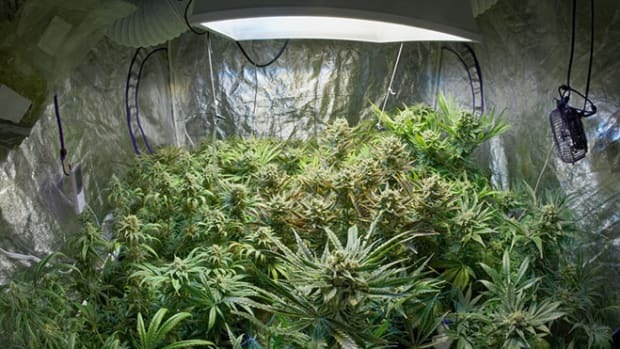 It does not include treatment at an emergency room, a private doctor’s office, a self-help group such as AA or NA, a prison or jail, or a hospital as an outpatient. We can see from these two graphs that there are significant disparities between who utilized treatment and who did not. 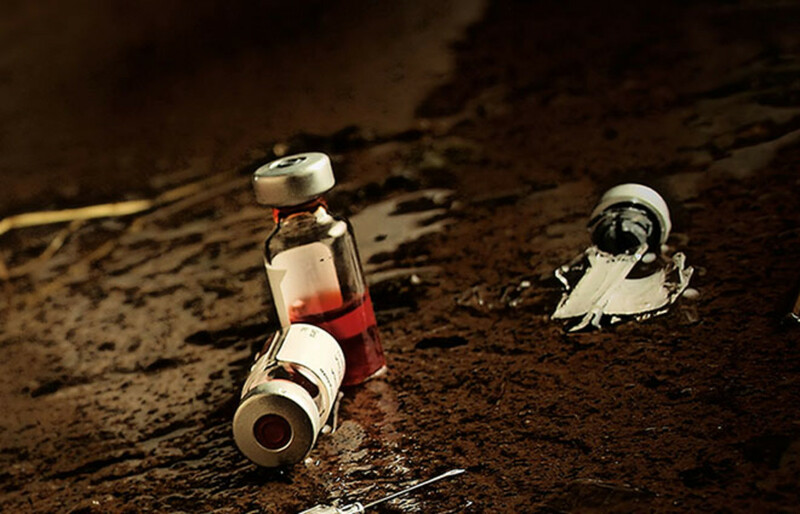 The most provocative statistics shows that six out of 10 people with a heroin use disorder were likely to get treatment, compared to sixout of 100 people with an alcohol use disorder. In other words, people with problematic heroin use, who constitute less than two percent of all Americans with an SUD, were about 10 times more likely to use rehab treatment than those with an alcohol or marijuana use problem, who comprise over 80 percent of Americans with SUDs (see Figure 3). Indeed, these alcohol and marijuana disorders are the least likely of all SUDs to be treated. 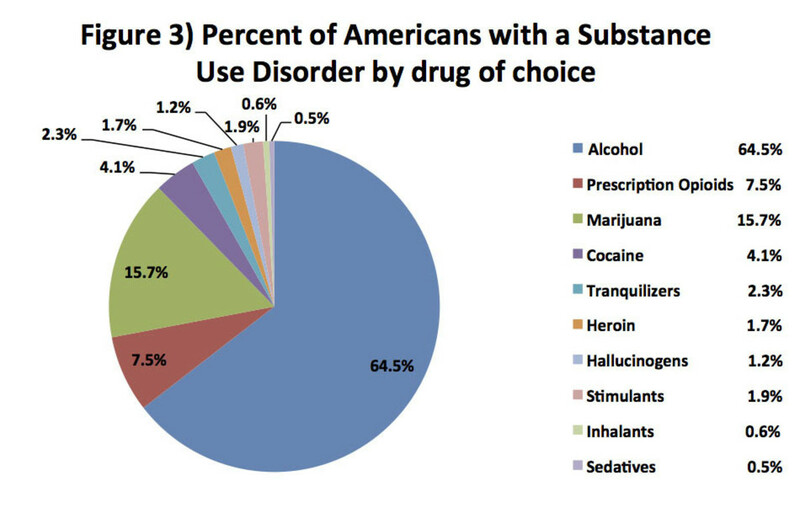 Figure 4 shows what percentage of users of each substance are recreational users vs. substance abusers vs. substance dependent (the “abuse” percentage was calculated by subtracting the number with “dependence” from the number with “abuse and dependence” in the NSDUH data). As we can see, the vast majority of users of each substance are recreational, or non-problematic, users—with the notable exception of heroin: Fully two out of three people who use heroin are dependent on the drug. It is important to note, however, that other surveys, including the Epidemiological Catchment Area Survey (ECA), have found much lower rates of heroin use disorder among users. 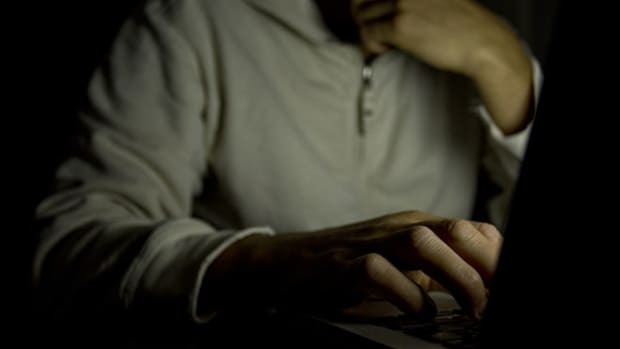 Although the ECA statistics cover the late 1980s, and therefore offer only a historical comparison, the finding of this large study—44 percent vs. 65 percent—is more representative of what the majority of research had found. So far we have looked at which substance users go to rehab. Now let’s look at how well rehab works. Do those who go to specialty treatment for addiction fare better than those who get no treatment at all and kick on their own? To explore this question, we turn from 12-month data to lifetime data. According to the National Epidemiologic Survey on Alcohol and Related Conditions (NESARC), which included some 43,000 people and was conducted between 2001 and 2005, only 11.8 percent of people with an alcohol use disorder ever received specialty treatment. If AA attendance is included as a form of help seeking, that percentage only increases to 14.6 percent. However, in spite of this, the NESARC data also shows that the lifetime recovery rate for alcohol dependence is over 90 percent. NESARC also shows that the lifetime rates of treatment utilization (including AA) for any drug use disorder are 8.1 percent for abuse and 37.9 percent for dependence. Lifetime treatment utilization (including AA) for prescription drug use disorders, by drug category, is: tranquilizers, 38.6 percent; stimulants, 28.6 percent; sedatives, 35.7 percent; and opioids, 31.9 percent. Compare that to lifetime remission rates for these disorders: tranquilizers, 98.3 percent; stimulants, 99.0 percent; sedatives, 98.7 percent; and opioids. 96.1 percent. The lifetime remission rates for illicit drug use disorders are 97.2 percent for cannabis and 99.2 percent for cocaine. Lifetime treatment utilization rates for these two drugs apparently have yet to be researched, however. It is worth noting that nicotine is the hardest of all drugs to kick, with a lifetime remission rate of 83.7 percent. Yet there are no residential rehabs for cigarette smokers. Although research suggests that smokers who get some form of treatment have higher success rates than those who do not, it also tell us that only about one fifth of smokers get any sort of treatment: Therefore, as with other substances, the majority who kick their nicotine addiction do so without treatment. 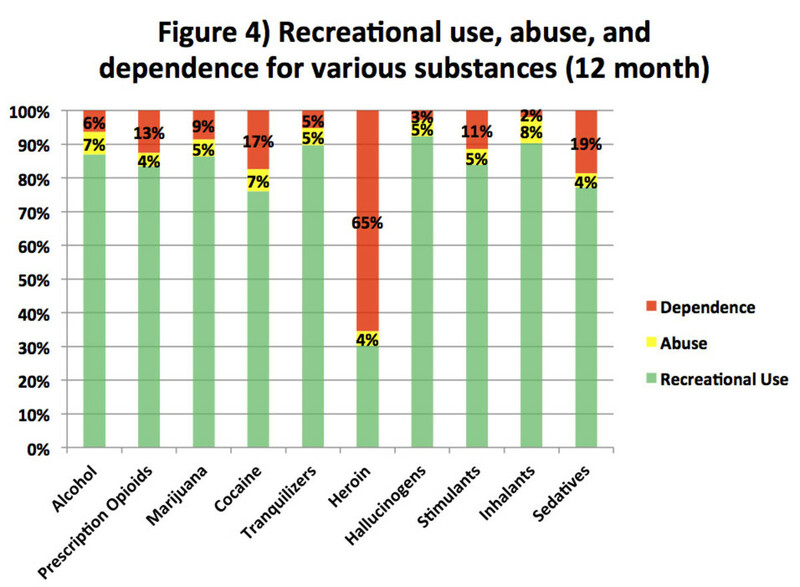 What these comparisons of substance use data suggest is that even though the majority of people with problematic use never get rehab treatment or go to AA, the success rate in kicking abuse and/or dependence is very high. Now, the half-life of an addiction is the amount of time it takes for half of the people who have that addiction to recover from it. 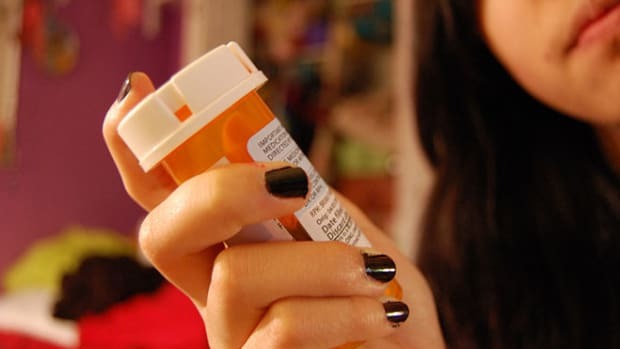 NESARC shows that the half-life of prescription drug use disorders is: stimulants, four years; sedatives, tranquilizers, and opioids, five years. The half life for other substance dependencies are: cocaine, five years; cannabis, six years; alcohol, 14 years; nicotine, 26 years. It would be of great interest if future researchers using the NESARC data would crunch the numbers to answer the question for us: Does treatment do anything to shorten the half-life of a substance abuse career? Or do those who get no treatment do as well as, or even better than, those who do get treatment? Such an analysis would go a long way toward answering questions about treatment’s effectiveness. The answer lies in the raw data collected by NESARC—all we need is a researcher to tease it out. One question of great interest that remains to be answered is: How effective is treatment when compared to the rate of spontaneous remission? And what types of treatment are effective? The NESARC study has amassed a huge amount of data that can be used to address this question, but unfortunately no researcher has (yet) crunched the numbers. 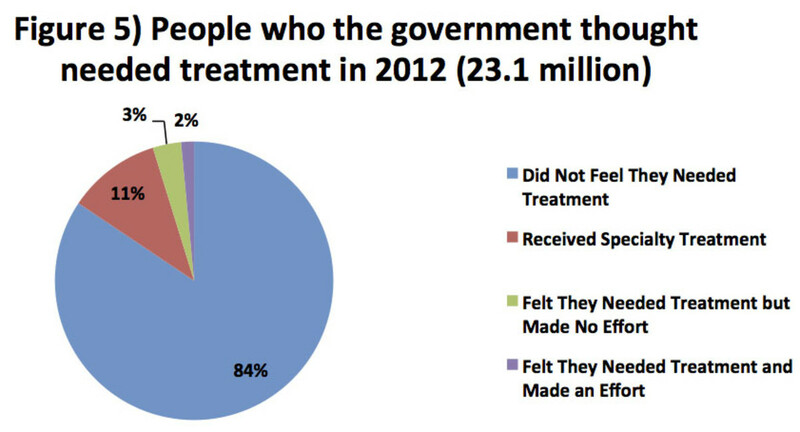 Another fascinating fact we find in the NSDUH data is that 84 percent of the people the government thinks should have treatment do not want treatment, as illustrated in Figure 5. 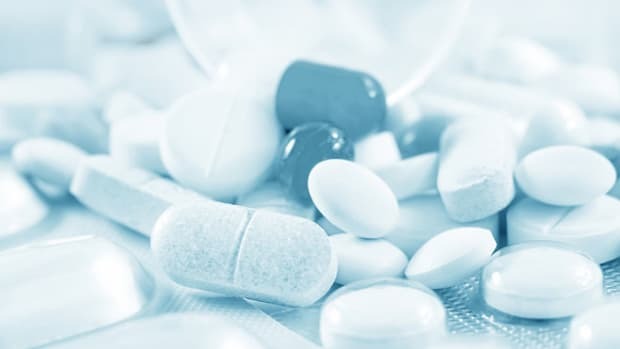 The government’s criteria for those who should get treatment involves three categories: individuals who met DSM-IV criteria for “Substance Abuse,” those who met the criteria for “Substance Dependence,” and everyone who received treatment regardless of DSM criteria. Although both the federal government and the addiction treatment industry use these statistics when calling for increased access to treatment—in order to meet this perceived “need”—the vast majority of people with an SUD do not in fact feel this need. And as we see, the data back them up—a fact that is not as widely known as it should be. The conventional wisdom says that this glaring gap between the perceived need for treatment and the felt need for treatment is a sign that we need to do a better job of persuading substance users to enter treatment. Two of the main reasons typically given for why substance users do not want or do not get treatment are lack of resources and psychological denial. The Affordable Care Act increases access to mental health and addiction services; public awareness campaigns, media attention, and entertainment such as Dr. Drew Pinsky’s franchise, have both reinforced the concept of denial and promoted the act of overcoming it. It is important to ask whether this enormous—and growing—financial and cultural investment in addiction treatment is wise or wasteful. Research tells us that treatment has some benefit for some people. Indeed, former users report that it saves lives. But research doesn’t tell us who is most likely to benefit—and therefore where the resources should be spent. Are the substance users who have the most severe problems the ones who are most likely to benefit from treatment? Such questions require answers. As a former consumer of substance abuse treatment and as a person who works with active substance users, I believe that the primary reasons people do not want to go to substance abuse treatment are: (1) they will be disrespected as individuals, (2) abstinence will be forced upon them whether they choose it or not, and (3) spirituality will also be forced upon them. This is a basically accurate description of most of the alcohol and drug treatment currently available, particularly for poor people. A new treatment paradigm that meets people “where they are at,” encouraging them to pursue goals they choose for themselves, would attract rather than repel people who need help. Patt Denning, Jeannie Little,and Andrew Tatarsky have done pioneering work on developing such a paradigm; they report many successes with clients who have been resistant to traditional forms of treatment. My own experience tells me that this paradigm should become the standard of care. At the very least, advocates of the current treatment paradigm would do well to expand specialty treatment to include this approach. The disease model is convenient to liberals because it spares them having to say negative things about poor communities. But this conception of addiction harms the very people we wish to help.